Dr. Hala Fadli, licensed dermatologist both in the UK and in Dubai with over 15 years of experience in dermatology, announces a new and cutting edge procedure she currently exclusively offers: The non-surgical nose job. The Non-Surgical nose job is a simple procedure with no down time designed to change the shape of the nose with a few simple injections of a filler substance like Radiesse. The procedure is done under numbing cream, with virtually little or no pain, bruising or swelling, and takes 20 minutes. Patients can return to work or social life immediately with instantaneous results! A filler substance is placed through controlled and precise injections to hide away dents, bumps, side way deviations. It raises the nasal tip, or contour irregularities to restore a more symmetric look to your nose. The end result is that the nose will look more proportional and smaller in your facial frame. Results are instantaneous. Wish to diminish the appearance of bumps on their nose. Have dents, hollowness or indentations, or have noses which look asymmetric. Have a flat nasal bridge, and wish to create a bridge or augment their original bridge. Have droopy tips or downward appearing tips who wish to raise the tip of the nose. Have had surgical nose jobs in the past and are unhappy with the appearance of their noses. This procedure is perfect for those who are not 100% emotionally and physically ready to undergo surgery and want to get the feel of a new nose for a “test run”. This procedure can help them decide if a nose job is right for them. thanks great work out . . . While there is really no guarantee with any surgical procedure, rhinoplasty generally has good results. Those who require the surgery for breathing issues are usually able to notice a difference soon after the surgery is completed and the swelling has subsided. Rhinoplasty or nose reshaping surgery. Nose is most important part of anyone, so a beautiful nose increase the beauty of face. Nose reshaping Dhabi its really amazing. Nice and useful blog. I am very impressed from your blog. Nose is most important part of anyone, so a beautiful nose increase the beauty of face. 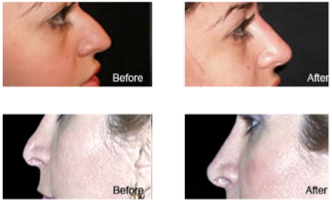 Nose reshaping surgery Delhi it’s really amazing.